How Did Henry Get So Fat? Since 1530 the Tudor kitchens have been a stable of Hampton Court. Even after Henry VIII's death, they continued to be used by the Tudors, the Stuarts, and the Georgians. 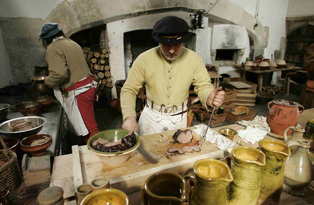 The huge kitchens were built to feed over six hundred courtiers at a time, and although not used quite on that scale today, they are still an important part of life at the palace. For the last few years, food historians have been researching the history of Tudor cuisine, and use the kitchens to experiment in making traditional recipes. Many of these recipes are now openly shared with the public at live cookery events. On the 1st & 2nd of December, you can join the cooks and learn all about the different meals that used to be prepared in the Tudor period, and on the 27th December, there will be a special Christmas cookery class where you can discover the culinary delights and indulgences Henry and his many wives feasted on during this time of celebration. After you've been tempted (or put off) by the demonstration, head down to the Tiltyard cafe and dine on an authentic tudor meal starting from £6.50. The price of the event is included in the palace entrance ticket, which is between £13.86-£16.95 for adults, and £6.93-£8.50 for under 16s.